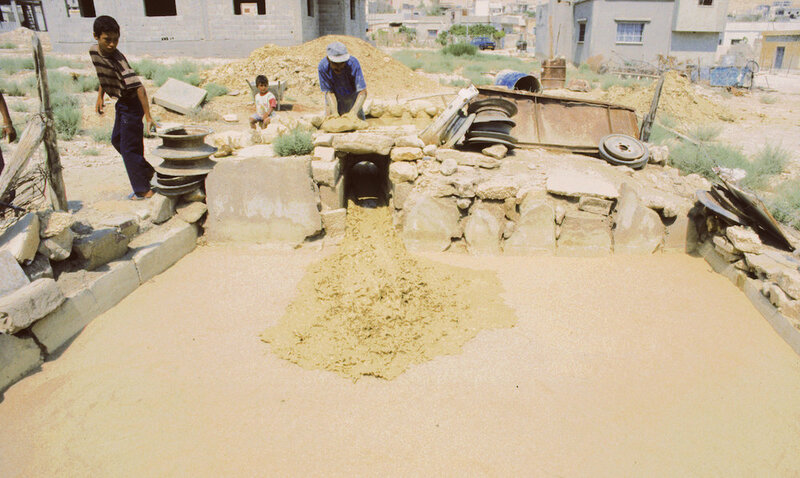 With the basin sealed and lined in sand, Azmi pulls the stone that blocks the channel between the first basin and the second. The thin slurry of water and suspended clay floods the prepared area. In this large basin the process of cleaning and mixing the clay will continue. The sun will contribute to the process by removing the water. Depending on the purpose of the job, other ingredients may be added to the soupy mix. This traditional Palestinian potter's workshop is located in the refugee camp of Aqabat Jebar, south of Jericho.